IN his continuing search for the more weird and wondrous in this world, David Ellis says that in one of the more bizarre acts of confidence, builders of a bridge in China that has a glass decking so users will have the feeling of walking in space, are going to have volunteers try their hardest to actually shatter that bridge's see-through decking before it officially opens in July. On the 25th of this month, with scores of TV crews and newspaper journalist watching-on, the volunteers will be given hammers to try to break panels of the Zhangjiajie Grand Canyon Glass Bridge, and when that hopefully fails, twenty of them will jump up and down on the hammered glass panels – and finally a car laden with passengers will be driven onto it. 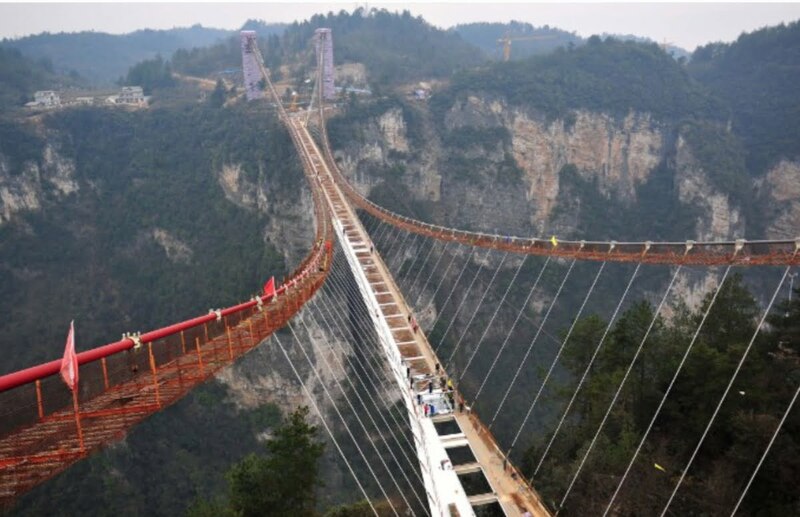 The Zhangjiajie bridge will be the longest and highest glass-deck bridge in China when it opens next month 60km south-west of Zhangji in Hunan Provence, and according to Mr Dotan will be strong enough to carry 800 users at a time. Those who suffer acrophobia (fear of heights,) are advised to give it a wide berth.